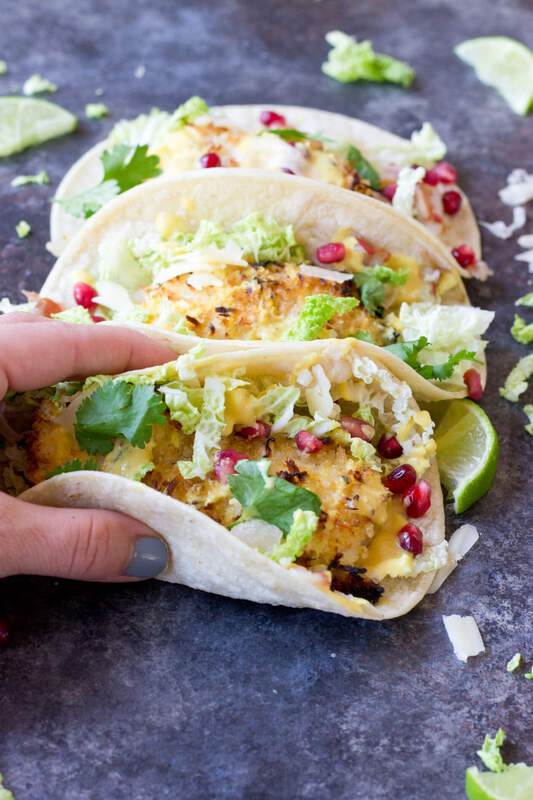 This recipe post for Crispy Fish Tacos is sponsored by the National Fisheries Institute. Happy (almost) Friday! I know it’s not Tuesday but I have tacos for you today. In our house we can eat tacos most nights of the week and Tuesday is just an excuse to eat more tacos, can you relate? One thing our fam needs to get better at is incorporating more fish into our diet, since 2-3X per week is the goal according to the Dietary Guidelines for Americans. Well twist my arm, I’ll eat my weekly fish quota at one meal if it’s served in crispy fish tacos form!! Raise your hand if you agree? This recipe incorporates seasonal fresh ingredients like pomegranates and pears… and it’s actually rather easy to prepare at home. 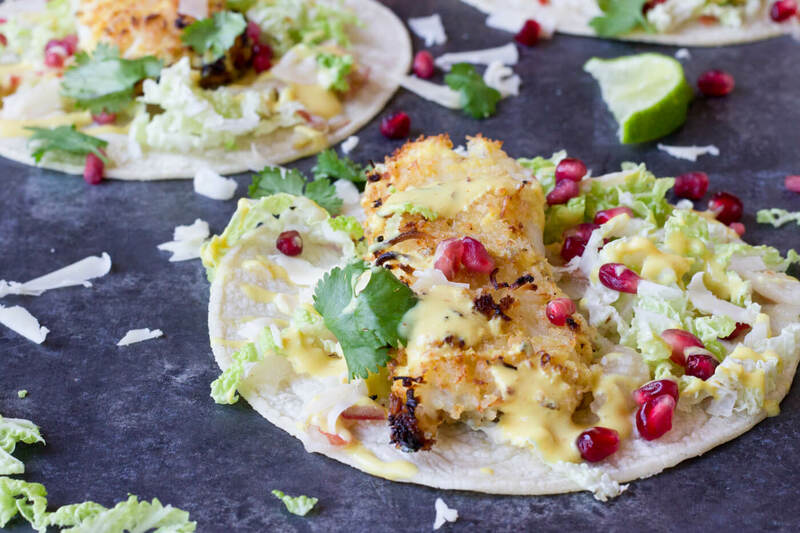 Fish cooks up super fast so you’ll have dinner (or lunch) on the table in 25-30 mins with this delicious Crispy Fish Tacos recipe. Cause I need more of that in my life too: simplicity. Fish makes life more simple and there’s a wide variety of fish to choose from! You’ve probably heard salmon, tuna, halibut, and mackerel are great sources omega 3 fatty acids important for brain and eye health, but cod is often an overlooked hero because not only is it rich in omegas it’s also one of the few sources of vitamin D in the diet. Don’t like to take supplements? Me either!! So get your fish in each week to benefit from those important nutrients that are essential for health and longevity. For more delicious and versatile seafood recipes, visit the Dish on Fish website. Crazy for tacos? 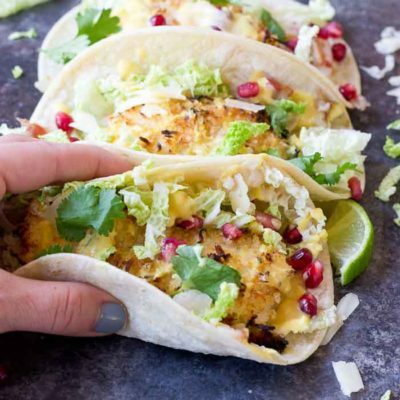 Add these Crispy Fish Tacos to your menu! Crispy baked cod topped with pomegranates, shredded pear, and Honey Lime Crema. Simple to make at home! In shallow dish whisk together Greek yogurt, lime juice, and honey. In separate shallow dish, toss together bread crumbs, coconut flakes, and a pinch of salt and freshly grated pepper. 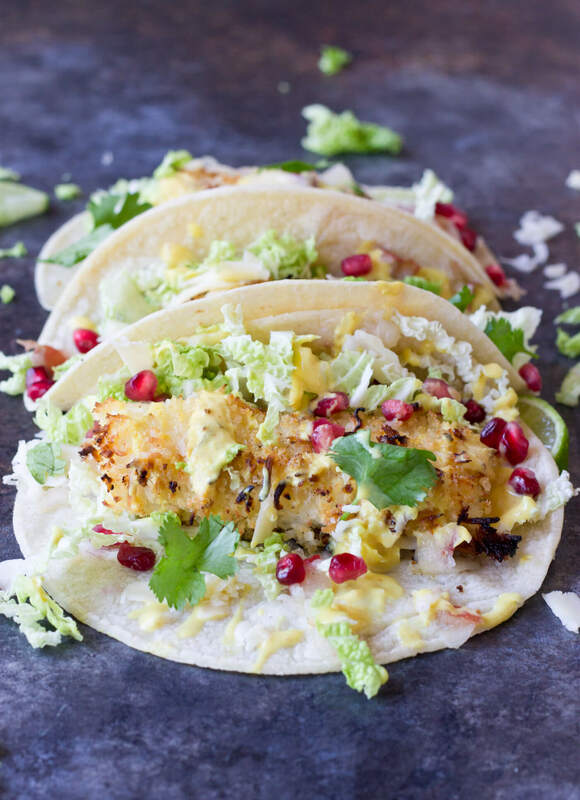 Cut cod fillets into strips that will fit into tacos (about 1 1/2 to 2 ounces each). Dip fish into yogurt mixture and then coat with bread crumbs and arrange on baking sheet. Pour melted coconut oil ontop of fish or spray with cooking spray. Bake for 15-20 minutes; with 2 minutes remaining, broil fish until golden brown. Meanwhile prepare the dressing. In a small bowl, whisk together Greek yogurt, mustard, honey, sriracha hot sauce and lime juice. 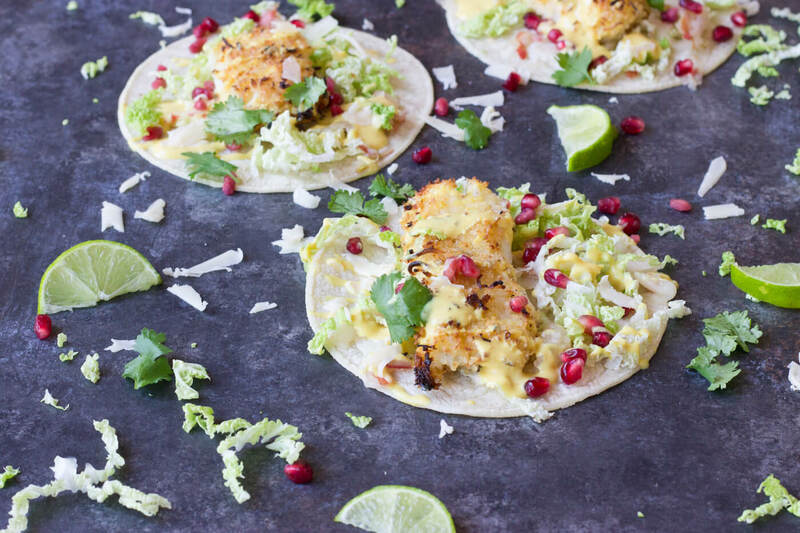 Assemble tacos with napa cabbage, pomegranate arils, shredded pear, baked crispy cod, drizzle of honey lime sauce, cheddar and cilantro. This is a sponsored conversation written by me on behalf of National Fisheries Institute. The opinions and text are my own. I made these last night and my whole family loved them! Thank you so much for posting this recipe. 🙂 The fish turned out wonderful with the panko and coconut breading and the topping combinations was delicious! OMG! YAY! I’m so so glad to hear they all loved them.